Chicago Northwest Division/Tuley H.S. "Wildcats"
Northwest Division High School was created in 1888 from what can be told, due to history we have on the former Chicago Central High School. In 1882, Chicago Central closed its doors and three other high schools (North, West, and South Divisions) took all the students. After that took place, Northwest Division opened its doors at North Claremont and Potomac and graduated it first class in 1892. The school changed its name to Tuley High School (named for Murray Floyd Tuley, who was an influential judge in Chicago during the 1850’s) in 1908. The school closed in 1974 when Roberto Clemente High School (now Roberto Clemente Community Academy) took its place to honor the baseball Hall of Famer on Chicago's West Side. He served from 1888 - 1928, an amazing 40 years. The new building at 1313 N. Claremont, opened in 1891 and the first graduating class was in 1892. The school name changed in 1908. Judge Tuley died on December 25, 1905. The school name was changed to honor Judge Tuley in 1908. *Knute Rockne is Tuley's most "famous STUDENT" and not a graduate. He left school in his senior year. *Saul Bellow is Tuley's "most illustrious graduate." Tuley High School had several years where senior classes held two graduations, one in January and one in June. The last January graduating class was held in January of 1967. We have joined to sing your praises, now to do or die. Gold so brilliant as the sunshine, blue the sky above. Hail to thee our Alma Mater, Tuley loved so well! It is conceivable that Northwest Division was a member of the Cook County League and Tuley continued that affiliation plus was involved in the Chicago Public League while it was in operation. 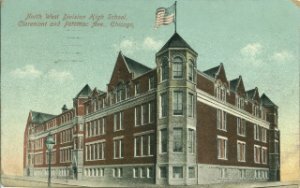 Noted high school historian Robert Pruter tells us that Northwest Division High School is also credited with being the first public high school in Chicago to have a gymnasium. The school did not win any team titles in the Cook County League, and even though it was a charter member of the Chicago Public League, it did not win any team titles thru 1939. For certain, we know that track and cross-country were offered at Northwest Division, while baseball and track were available at Tuley. It may have been possible that other sports such as football, basketball, and wrestling were played at the school, but there are no win-loss records to prove that they were offered. Whether or not the female students competed in athletics is unknown, but one would want to believe that the school offered other activities to round out a student's experiences such as speech, debate, drama, band, chorus, and dances. We would enjoy hearing from a Tuley grad or interested person that knew the school's history to contact us with more information. Northwest Division was competitive on the cinder tracks around the state of Illinois, coming home with a top-five finish at the state meet in 1901 and having several individuals bring back some medals for their efforts at the finals in Champaign-Urbana (where they were held at the time), which includes the all-around talent displayed by Frederick Speik. As Tuley, the school brought home medals in the shorter (or speed) events. 1901 TIED FOR FOURTH IN STATE!!! At the time of researching this page, we were made aware that the school (listed as Northwest Division) did compete in this event, according to Robert Pruter. In November of 1907, Northwest Division along with McKinley, Medill, Crane, Austin, and Oak Park were involved in a meet on the west side of Chicago. Nothing more has been found about Northwest Division's harriers. Knute Rockne, famous coach of Notre Dame University football from 1918 to 1930, was a student of Northwest Division High School, Notre Dame, and a member of the College Football Hall of Fame. A nice history of his life can be viewed at http://en.wikipedia.org/wiki/Knute_Rockne . Although there are no win-loss records to prove that the school did offer this sport on the IHSA website (www.ihsa.org), we do know that a Tuley grad did make his way to the professional ranks. Mel Beckett was a center that went on to letter at Indiana in 1950-51, then found himself in a starting role at the same position with the Saskatchewan Roughriders of the Canadian Football League from 1953-56. Beckett was an CFL all-star in 1956, but was killed in a plane crash while returning home from the game at Vancouver in December of that year. In his memory, Beckett's number 40 jersey was retired by the Roughriders, and a trophy that bears his name along with that of another teammate who was killed in the same plane crash (Mario DeMarco) is awarded annually to the top lineman in the CFL's Western Division. Tuley enjoyed two spring seasons with a trip to the state tournament to take its place to represent the Chicago Public Schools system as one of best in Illinois, prior to the two-class system. One of those seasons was in the school's final year of operation before it changed its name to Clemente. --Joe Grabowski— notable professional basketball player with Chicago, Indianapolis, and Philadelphia from 1949 to 1961, doing so without going to college. He was discovered playing semi-pro ball with independent teams after high school before he signed with Indianapolis. --Harold Atteridge-- was a lyricist and librettist on Broadway, working for the Shuster Theater chain. More about his works can be found here: http://www.songwritershalloffame.org/notable_writers/C5006 and http://query.nytimes.com/mem/archive-free/pdf?res=F00715FE3F5E13738DDDAD0994DE405B848DF1D3. --Sydney J. Harris— Chicago Daily News columnist in the 1950s and 1960s. --Allen Sherman – was born Allan Copelon, he became a nationally known comedian, especially after his hit, “Hello Mudduh, Hello Fadduh!” became a huge sensation in 1963. --Jule Styne – notable composer-songwriter of many standards, including "Everything's Coming Up Roses," "Diamonds Are A Girl's Best Friend," and "People." --Mike Todd – motion picture producer and showman, was married to actress Elizabeth Taylor at the time of his death in a 1958 plane crash. --Sam Wanamaker – worked as both a director and actor in motion pictures and television, and in theater, was most responsible for building the Globe Theater in London. "I am from the 1960 June Class of Tuley. I was looking for a picture of the school and came across your site. I found many of your facts very interesting. I do remember the baseball team going down state. It was a big deal then - we had a great team." "Is there someone directly now with the old Tuley High School or now with Roberto Clemente (Academy) that can help me? "Let me briefly explain: When my father passed away on August 14th 1961, my mother sent me to live with my brother in Chicago, and for four months thereafter I was enrolled at Tuley H.S. on Western Avenue is all that I recall. Now I am 67 years of age and have never forgotten the teachers that were kind and good to us. "My parents had 14 children and I was the one that left home to live in shelter houses and hobo camps across the country. Once living on the streets of Chicago, I belonged to a neighborhood youth group called "The Latin Counts" of 18th Street and would like someday to see them or have contact with them again. "I know some of them might have gone to Tuley. But all that I know are there first names and they are: Louie, little Ray, and more importantly was our leader " Sal" who I have featured in my Autobiography ("Midnight Confessions") and life's journey. Besides that book, I've written various others but my memories of the city of Chicago and its great people have always been close to my heart"
"My name that I used in Chicago was "Rusty" and I am trying to reach some of those members of the "Latin Counts" that I briefly knew when I was in your city. "At 17 years, I rode box cars throughout the United States but I have never forgotten those memorable times I had as a youth in Chicago... please contact me at silverfoxuno@hotmail.com. Thank you and anxious to hear from you, Ruperto Aguirre." "I graduated in 1968. My name then was Nydia Esther Cruz. In the film/tv industry my name is NYDIA RODRIGUEZ TERRACINA. I married my high school sweet heart Vidal Rodriguez, who also went to Tuley. He died in 1980 in a motorcycle accident. I then remarried Mr. Terracina - married 30 years! "If you happen to look me up in the IMBD movie site...all the features I have worked on are listed under that name. I am not trying to toot my horn but I DO get a "kick" out of saying "from Humboldt Park, Tuley High to the big screen!" ...and reflecting that back then...I had NO idea where I would end up! I have the BEST memories from Tuley High School...I absolutely loved it there! The teachers were so upright and fair in the treatment of students.We were treated with such respect! "I happened to look up your site because my daughter was telling me about her upcoming 10 year high school reunion. I was telling her that our graduating class was large. I tried to looked it up on your site and unfortunately I couldn't find the number. It was held at the "Armory" located at the corners of Kedzie and North Anenue. Do you happen to know the size of the 1968 graduating class? Thank you so much for your time and energy! With regards, Nydia. Go WILDCATS!" "My Name is Francisco but the 1971 year book has me down as Anthony, I graduated in 1971 I was on the Basketball team in 1970 They call me (Hopper) because of how high I jumped that name comes to me since Grammar School, a friend named Peter Estrada gave me that name and it stayed with me till High School. I love that name and many people knew me by that name only. Any way I just wanted to leave some Comment for you or who ever is reading this I LOVED TULEY HIGH SCHOOL some of my best years of my life you can say are in my memories with Tuley I had lot's of friends, partied, had lots of girlfriends, and I in joyed going to School. never had any bills to pay or problems, never worried about what was going to happen to me or where was my life going all I did was in joy life. now I have a family, bills to pay, a very responsible job a carrier, problems in the World, Wars, a no good President that we don't know where the country is going, the music is different these days it wasn't like the olden days when you can really here the music and in joy it what's this rap music now what's that all about I hate it. Stress every where am older now not sick thank god but I do have to take care of my self not like when I was a teenager. so you see this is why I miss my Golden Years at Tuley why do we have to change? I'll never know why. well am glad of my life right now because I have what I have because of a good Education from Tuley and I want to thank you for that, I'll see you who's ever reading this and I hope you have time to reply on this short story of my and how I miss those Years. God Bless. Tony Villarreal (HOPPER)"
"I think our class was one of the last that had the split grades which were A and B. (A graduating senior was 4A while those who just became seniors were 4B.)"